earn a $1,000 Hiring Bonus! We want to meet you at our LIVE hiring event! We will be conducting open interviews and same-day applicants are welcome. 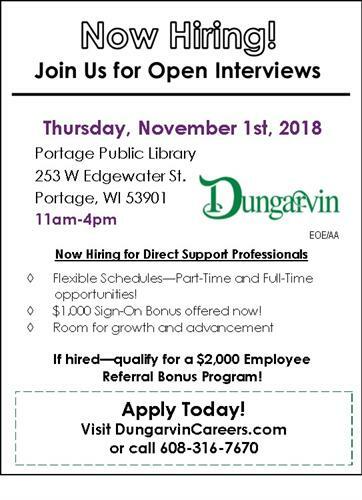 Apply online at DungarvinCareers.com or call a recruiter today at 608-316-7689. At Dungarvin, our direct care professionals are responsible for providing and coordinating direct services and healthful lifestyle supports to individuals with varying mental and physical disabilities. Intense Behavior Supports will be provided at these sites. These living supports include assisting the individuals in every aspect of their lives according to their Individualized Support Plans (ISP) with the goals of fostering increased independence, choice, and empowerment. Duties for the Direct Care Provider also include assisting in maintaining a clean and safe living environment and meal preparation, as well as completion of various household duties. Experience working with Intensive Behavioral Supports. A sincere desire to provide individualized supports to persons with developmental disabilities.